Alpine Fresh Appliance Cleaner is a non-corrosive and non-toxic cleaner that can be used on all types of catheters, urinary supplies and ostomy products. Biodegradable and ideal for everyday use, this ostomy cleanser deodorizes and disinfects leg bags, urinary drainage bags, Coloplast ostomy supplies and most ostomy and urinary appliances in general. If you're looking for a safe, effective cleanser formula that can be used on all types of catheters and urinary supplies sans problems, give this economical and non-toxic appliance cleaner a try. Alpine Fresh Appliance Cleaner can be used independently or in conjunction with other Convatec ostomy supplies and products. No matter what ostomy or urinary products you need to clean, this ostomy appliance cleaner can do the job for you in little to no time. 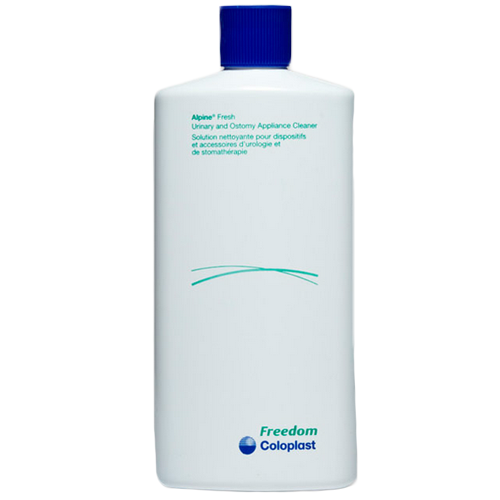 Don't spend more time than you have to disinfecting ostomy and urinary supplies - use this quick and efficient cleaner to thoroughly clean all of your ostomy and urinary supplies. Effectively cleans and deodorizes all different types of urinary and ostomy products without toxic chemical buildup and without corroding products. Economical, biodegradable cleanser that has been tested on and won't harm rubber or plastic. The only safe, non-toxic way to sanitize ostomy and urinary supplies. How do you use this product? I am new with my ostomy bag. Do I use it while it is on me or do I need to remove it? Please help. There is some instructions on the back of the packaging, but if you need more information, feel free to contact the manufacturer, they have a nurse on staff that can give you a more detailed answer. Works great, I like the no spill top.